The Japanese ukiyo-e artist Totoya Hokkei studied under the internationally famous Hokusai Katsushika. He was born in 1780 and passed away in 1850 during the Edo era. This period of Japanese history would witness many dynamics in the later part of his life because gradually the outside world was encroaching on Japan. Therefore, while the doors were not fully opened up until the Meiji Restoration of 1868, it is still clear that new artistic concepts were entering Japan. Hokkei during the early period of his life was a fishmonger but the pull of art meant that he started afresh. 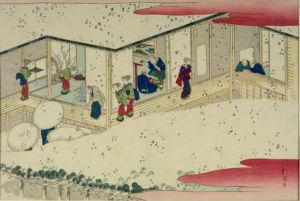 Initially, Hokkei studied under Kano Yosen but in time he would be remembered for studying under Hokusai. 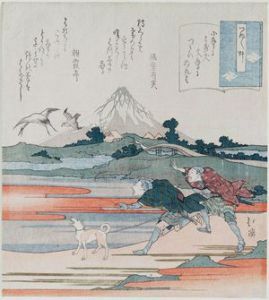 However, the past upbringing of Hokkei – and his own artistic talent – meant that he fused many areas while learning new ideas and concepts from Hokusai. 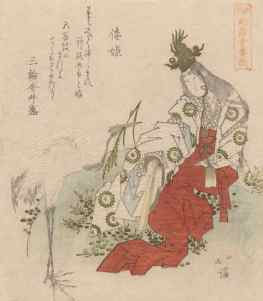 It is known that Hokkei focused on commissioned Japanese woodblock prints for wealthy individuals and circles in relation to poetry. He also focused extensively on illustrations for books. The work of Hokkei is based on adorable simplicity that fuses his own individualism and influences from other artists including Hokusai and Hishikawa Moronobu. In other words, the modern themes of the floating world to more traditional ukiyo-e artists both impacted on Hokkei. This reality illuminates the lightness of this intriguing artist. 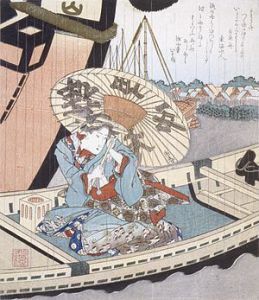 His woodblock print titled Beauty in a Boat during a Rainstorm (image below) highlights the delicate intricacies of Hokkei. In this print, the lady still remains elegant and calm despite the situation not being so bright. This applies to being in a boat and the effects of the rainstorm. However, Hokkei overcomes the inclement weather by highlighting the gracefulness of the lady in the boat. Similarly, the background color enables an intriguing print to materialize despite the simplicity of the theme. It is hoped that this brief introduction to Hokkei will intrigue readers to dig deeper because this individual produced adorable prints and illustrations. Some Japanese art and cultural articles by Modern Tokyo Times are republished based on the need to inform our growing international relationship about the unique reality of Japan.